The first women's college hockey national championship was played in 2001 between Minnesota-Duluth and St. Lawrence in Minneapolis. But in its 17 years of existence, only four teams have finished the season with "national champions' as their title. Here are the women's college hockey teams who have the most national championships — and have absolutely dominated the sport. NCAA Photos Clarkson has three national championships. It's no surprise Clarkson women's hockey entered the 2018-19 season at No. 1 in the rankings. The Golden Knights won the 2018 national championship 2-1 in overtime versus Colgate. They finished the season with an impressive 36-4-1 record. 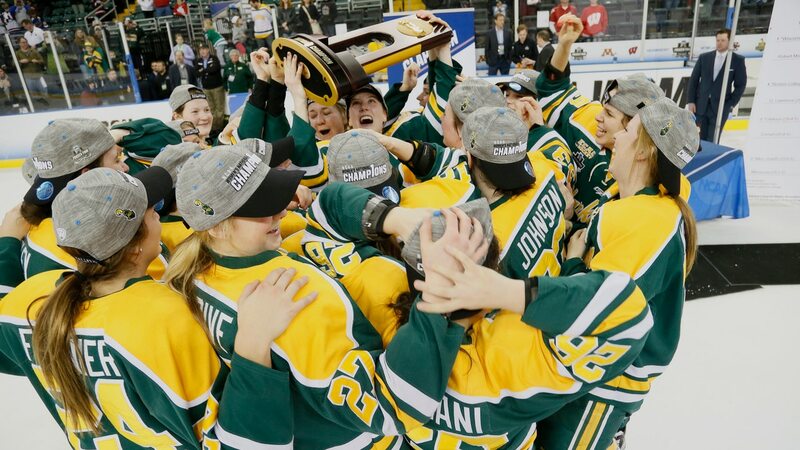 Clarkson also took the title in 2017, topping another women's hockey powerhouse, Wisconsin, 3-0. Their other championship came in a 5-4 win over Minnesota in 2014. Clarkson has been on the rise, and it doesn't look like they're slowing down any time soon. Harry Scull Jr. | NCAA Photos The Badgers' last title came in 2011. The Badgers haven't won a national championship since 2011, but they started the 2018-19 season ranked as No. 2 behind Clarkson. Is this the year Wisconsin returns to the top? Wisconsin's first two national championships were border battles against Minnesota and Minnesota-Duluth. In 2009, they topped Mercyhurst in a high-scoring 5-0 final. The 2011 season brought a 4-1 victory over Boston University. Carlos Gonzalez | NCAA Photos Minnesota-Duluth has five national championships. Minnesota-Duluth holds five national championships, coming in just behind the state's flagship university. The Bulldogs have participated in — and won — perhaps two of the most nerve-wracking championship games. In 2003, UMD pulled off a 4-3, double overtime win over Harvard in their very own city. The 2010 championship called for three overtimes, with UMD finally topping Cornell 3-2. That game was played in Minneapolis, meaning there were probably a lot of Duluth fans in the house routing for the home team. UMD also claimed the first two national championships ever played, as well as the 2008 title. Gil Talbot | NCAA Photos Minnesota has more championships than any other program. The Minnesota Gophers are the queens of college hockey. They've won five national championships, including the two highest-scoring title games in the history of the sport. In 2004, the Gophers topped Harvard 6-2. Then, in 2013, they knocked off Boston University 6-3 for the title — this is also the only team who has gone undefeated through the national championship, finishing at 41-0-0. The also ended the 2005, 2012, 2015, and 2016 seasons at the top. Women's college hockey championships from 2001 to 2018.